Yay! A card that doesnt use the Pocket Silhouettes stamp set! This one was really quick and easy…less than 5 minutes from start to finish! I saw this card on Splitcoaststampers, and fell in love with it. Mine is a little different, I have left the ribbon off and used the same colour for the flowers. This card would look gorgeous as part of a gift set, with each card having different coloured flowers. Mmmm….now the brain is ticking! I am going to make this card tomorrow at the demonstration I have booked in, and I think the ladies will be amazed by just how quick and easy it is to put together. I’m sure they will love it! Cardstock: Whisper White, Rose Red. 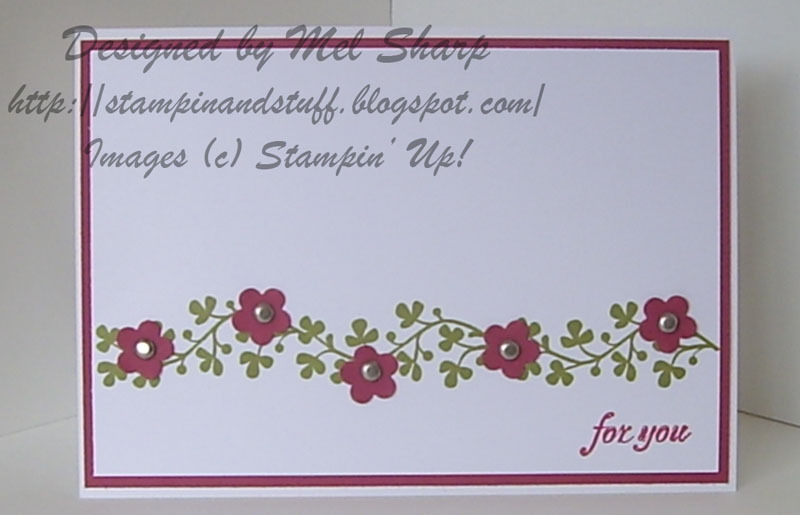 Inks: Rose Red Classic Stampin’ Pad, Old Olive Classic Stampin’ Pad. 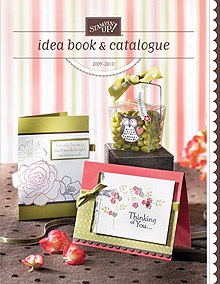 Accessories: Trio Flower Punch, Crafter’s Tool Kit, Silver Brads. This entry was posted on Friday, August 7th, 2009 at 8:13 pm and is filed under Fresh Cuts, SU. You can follow any responses to this entry through the RSS 2.0 feed. You can leave a response, or trackback from your own site.